Some days start out with such promise, then go down the tubes so fast. My old Noodle cow, who turned 18 in March, had her 17th calf in the night. I don’t know for sure what happened, but the very big bull calf doesn’t appear to have ever moved, so I suspect the sack was over his nose and he smothered. At her age and with the effort to have the calf, she may have rested a bit before getting up and getting on with the job she knew so well. Perhaps that’s how the sack stayed on him long enough to kill him. Maybe the placenta was tangled and pulled loose during the birth process. I don’t know. I’ll never know. But I do know she was a tired, worried old cow when I got there this morning. She had been fighting off the vultures since daylight. There were about 20 of them around her, but she hadn’t let them touch her calf. She started “talking” to me as soon as I got there and was licking my arm and then her calf. I really think she thought I could fix it. Oh but that I could. I raised Noodle on the bottle. She started her life on my kitchen floor as a weak calf syndrome calf. She’s always known and trusted people and expects the very best out of everyone she has met. 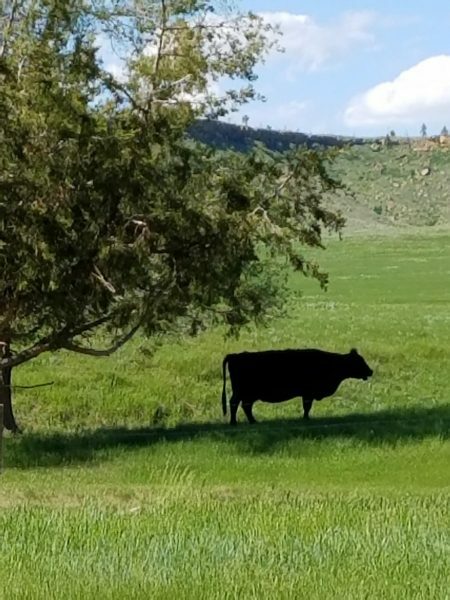 Her connection to people is unshakable and despite the genetics to be a cow that would hurt you, the worst she’s ever done is step on a foot by accident. Noodle was so expectant as I stood there with her, my arm over her bony shoulders. I knew she needed to rest and she wouldn’t as long as the vultures were there. I had to haul the calf away. I drove off a ways and got the pup out of the back of the pickup and into the cab, knowing that in her agitated state, she might just get in the back of the pickup to get the dog. No use stressing her more. When I went back to her, I parked the pickup with the back tires in a low spot. The calf was really big and it took some grunting, but I finally got him loaded. She kept talking to him, as moving him had given her the hope that he was finally going to get up. I closed the tailgate and she tried to reach over to lick him again. I scratched on her neck, hugged her, and with eyes watering, got in and drove away quickly. She hurried back to where he’d been, then back to where I loaded him. She watched me for a moment, then spied the calves up on the flat several hundred yards away and hurried toward them, hoping he was there. In the mirror I saw her check them all over, then back to where he’d been. It was heart breaking to watch. I know better than to put human emotions into animals, but I do know that animals will grieve for their young. They feel a lot more than people who study them without really “knowing” them believe. For the next several days, I’m sure she’ll hurry to me every time I go out in the pasture, thinking I have brought her calf back. I don’t know if Noodle will ever have another calf. At her age, one never knows. She may not make another winter. The years are sure catching up with her. She’ll live out her life here just being Noodle. Even without raising this 17th calf, it will be enough.